Reducing the amount of air that leaks in and out of your home is one of the most inexpensive strategies you can perform, to help you save money on your utilities and feel more comfortable within the home. Sealing windows and doors, sealing attic holes into the home, sealing plumbing and electrical wall penetrations, sealing light fixtures and sealing the ceiling registers on your duct system, are just a few of the main areas that create drafts in your home and reduce the efficiency of your home. In most cases, the money spent will be recouped within the first year. 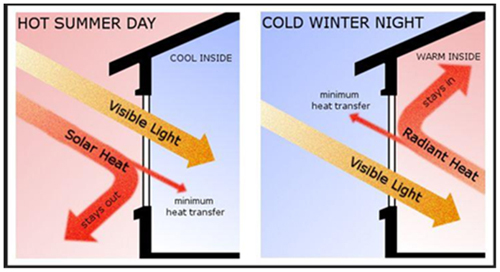 Windows affect the flow of heat in and out of your home, as well as the amount of natural light that enters a home, which influences how much electricity you use to keep your home comfortable. Poor quality and inefficient windows can create the feeling of draft due to the physics of changing air temperatures. Installing a good Low-E window with U-Factor ratings 0.30 or lower and Solar Heat Gain Coefficients (SHGC) 0.30 or lower will significantly reduce your utility costs. In addition, air tight windows will make your home much more comfortable.